Today, not only is it Julia Child’s 100th birthday, but last night the third series of The Great British Bake Off began on BBC2, and we thought that this was a good excuse to delve into some of the recipe books in our archive. People in the past enjoyed their cooking (or their eating) just as much as we do today, and went to great lengths to produce elaborate edible creations. 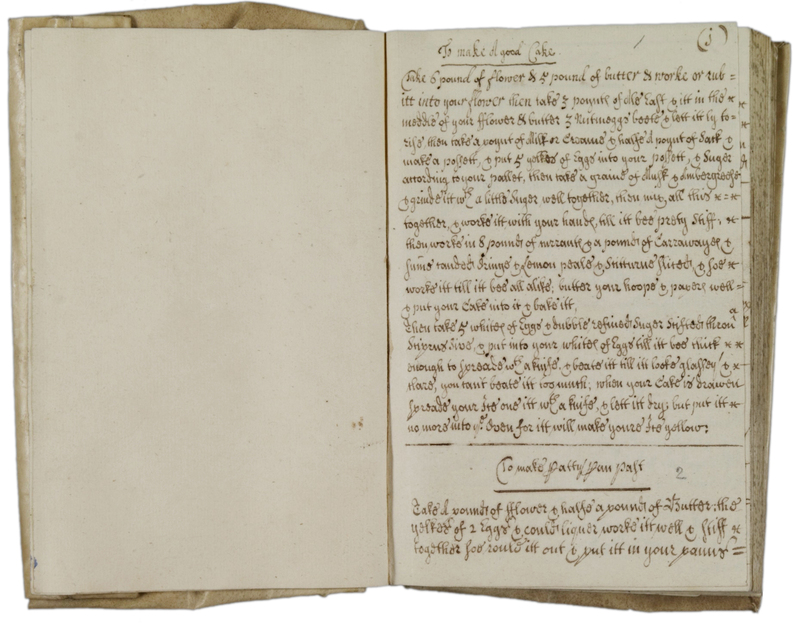 In this first of a special series of posts about some of the handwritten recipe books which are held at the ERO, we begin with one of the earliest recipe books in our collections, dating from around 1680 (D/DU 138/2). Unfortunately there is no name inscribed on the book to give us a clue to its author, but we do know that it was handed down between generations of the Clapton-Rolfe family of Rayne Hall. 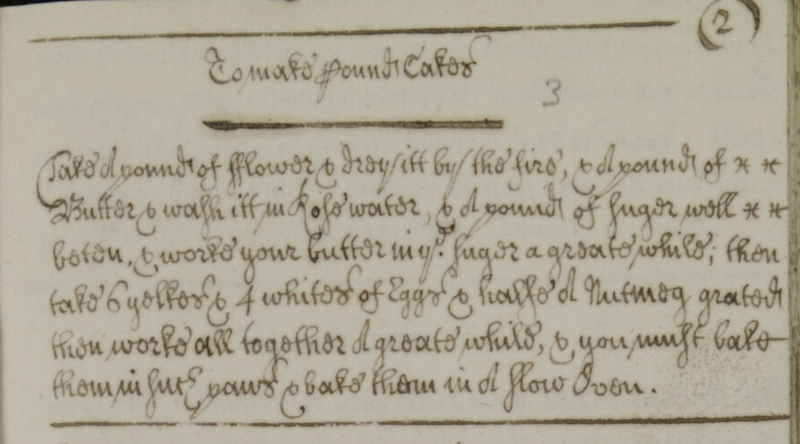 Take 6 pound of fflower & 5 pound of butter and worke or rub it into your flower then take 3 poynts of ale east [yeast] and putt itt in the meddle of your flower and butter, 3 nutmegs, beate & sett it by to rise then take a poynt of Milk or Creame & half a poynt of Sack [white whine], make a possett [made by boiling the milk or cream before mixing it with the wine] & put 5 yellows of Eggs into your possett & Suger according to your pallet, then take a graine of Musk and Ambergrease [a waxy substance that originates in the intestines of the sperm whale, with a pleasant smell, which is also used in perfumery], and grinde itt with a little Suger well together, then mix all this together & worke it with your hande till itt bee prety stiff, then worke in 8 pounds of currantes & a pound of Carrawayes and sume Candied Oringe and Lemon peale & scitterun [citron] slices & soe worke itt till it bee all alike, butter your hoope and papers well, & putt your Cake into it, & bake itt. Then take 5 whites of Eggs & double refined Suger sifted throu a Sciprus Sive [a sieve made of cypress wood, which was durable and had a nice smell] & put into your whites of Eggs till it bee thick enough to spread with a knive, & beate itt till itt looke glassy & clare [clear], you can’t beate it too much, when your Cake is drawen spread your Ice one itt with a knife, & lett it dry: but put itt no more into ye [the] Oven for itt will make your Ice yellow. As well as making us grateful for the modern use of full stops, this recipe uses fairly staggering quantities used – 6 pounds of flour, 8 pounds of currants – and must have been quite an extravagant affair. Eliza Vaughan, who wrote about the recipe book in the 1930s, imagined the cake as an ‘ice-coated monster’ crowning the tea table at Rayne Hall, or being prepared perhaps as a wedding cake. Take a pound of fflower & drey itt by the fire, & A pound of butter & wash itt in Rose water, & A pound of suger well beten, & worke your butter in ye suger a grate while; then take 6 yelkes & 4 whites of Eggs & halfe a Nutmeg grated; then worke all together A grate while & you mush bake them in such pans, & bake them in A slow oven. The book includes just 12 recipes in total, but also covers the art of pastry making and the preparation of certain meats, including chicken, rabbit, veal, lamb, pigeon, and turkey. You can view digital images of the rest of the book on Seax here. Look out for more baking-themed posts over the next few weeks!